Join us. June 9th, as we join together and send a message to the world. Remember, We belong to Mother Earth. *Allow ample time to park and walk to site (30-40 minutes). 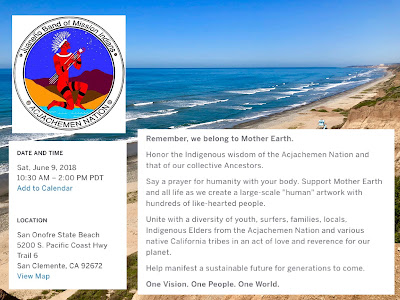 The Acjachemen Nation is a native California tribe who has stewarded, revered and inhabited territory in what is now known as Orange County for more than 12,000 years.